Enemies: The Avengers (Captain America/Steve Rogers, Firestar, Iron Man/Tony Stark, Scarlet Witch, Thor Odinson, Vision/"Victor Shade", Wonder Man), Rumiko Fujikawa, James "Rhodey" Rhodes, Charles Standish, Venom (Eugene "Flash" Thompson), "pampered bloodsucking fatcats"
Powers/Abilities: Rick Dennison's body became super-heated following his exposure to an experimental super-charged plasma that also destroyed his sanity in the process. He was later mutated, increasing his mass but creating an instability in his form. As Firebrand, Dennison had to be held in a containment harness -- capable of being controlled remotely -- to control his powers. He could shoot fireballs. (Iron Man III#5 (fb)) - A member of the radical environmentalist group Terra Tactics, Rick Dennison took part in a mission to sabotoge an alternative-energy research project with timed explosives. Wounded, Dennison was left behind by his partners and caught in the explosion. Thrown through a tank containing an experimental super-charged plasma, Dennison's body became super-heated. Held in an anti-burn fluid, Dennison was taken by terrorist outfit the Flaming Sword, who mutated him further and placed him in a containment harness. Preying on Dennison's mental instability following his accident, the Flaming Sword convinced him that they had similar objectives but they actually planned on using Dennison as a means to aquire wealth. 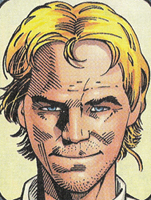 (Iron Man III#5 (fb) - BTS) - Appointed the Flaming Sword's chief operative, Dennison, now calling himself Firebrand, was active for several months, operating out of Europe and the Middle East. (Iron Man III#4) - Disguised as a cloud, the Flaming Sword's airship stayed out of sight above the resort destination of Isla Suerte. Launching his attack at night, Firebrand shot fireballs at the island, ranting about his desire to make the vacationing elite suffer. Seeing the attack, Iron Man suited up and confronted Firebrand, his opening assault proving futile. Stopping Firebrand from firing at the largest hotel on Isla Suerte, Iron Man hit Firebrand's containment harness, causing Firebrand to overload. Pushed into the surrounding ocean, Firebrand recovered and launched an attack, awakening the island's dormant volcano. (Iron Man III#5) - While the members of the Flaming Sword looted the hotels and resorts, Firebrand went after Iron Man, matching his lasers with fireballs. Crazed, Firebrand called for justice, blasting a rescue convoy into a magma stream. Noticing Iron Man's momentary distraction, Firebrand lunged at him, getting close enough for Iron Man to take control of his harness. 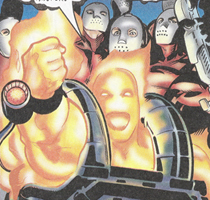 Iron Man used Firebrand's energies to drill a hole from the interior of the volcano to the ocean, releasing the pressure and shooting Firebrand outward. (Avengers III#0 (fb) - BTS) - Recovered, Firebrand reunited with the Flaming Sword and kidnapped Osborn Chemical vice-president Charles Standish, announcing their plans to kill him unless Osborn stopped their "deplorable chemical abuse" of third world nations. (Avengers III#0) - Confronted by the Avengers, Firebrand and the Flaming Sword attacked, shooting the Avengers' Quinjet out of the sky. Taking on Thor, Firebrand argued that he was the world crying out for justice and that Thor's lightning couldn't hurt him. Distracted by a hex blast from the Scarlet Witch, Firebrand was hit by Thor and Wonder Man and thrust into a rift between dimensions. The Avengers rounded up the other members of the Flaming Sword and promised to retrieve Firebrand once a suitable containment could be found for him. (Secret Avengers I#30) - Visiting Bagalia's bar The Hole Firebrand witnessed a fight between Venom ("Flash" Thompson) and Taskmaster. 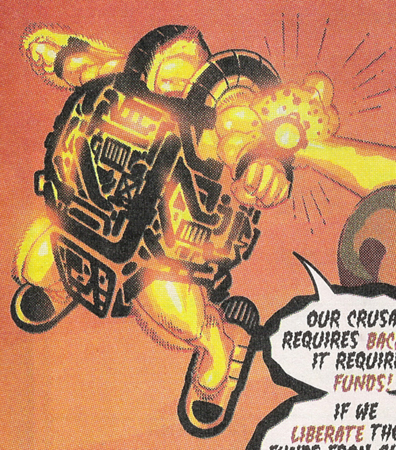 During the fight Taskmaster stabbed Firebrand in the chest to surround his sword in heated plasma. Taskmaster cut through the symbiote with his fiery sword, but Venom was saved by Ant-Man (Eric O'Grady). (Secret Avengers I#30 - BTS) - Like everyone else in Bagalia she got possessed by the Abyss. (Secret Avengers I#32 - BTS) - The Abyss was vanquished and the Avengers let the villains go free, having no authority in Bagalia. In Iron Man III#5, Firebrand's date of birth is given as 8/15/68. Avengers III#0 was released as an insert with Wizard Magazine#95. Update by Markus Raymond: Secret Avengers.